Gold has been on a tear lately. 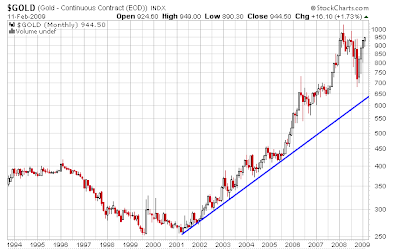 Indeed, gold was the only commodity that did not break its long term trendline during the massive commodities correction starting summer of 2008. 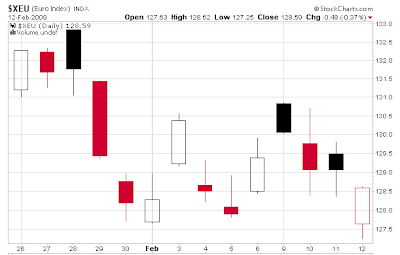 Click on any chart in this post to see a sharper image. 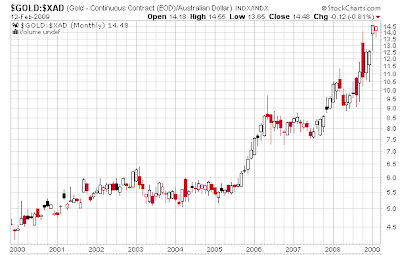 Many have not yet noticed, but recent strength in gold comes at a time of increasing strength in the dollar as well. Correlation between gold and the dollar has been near perfect since January 26, and more correlated than normal for quite some time. 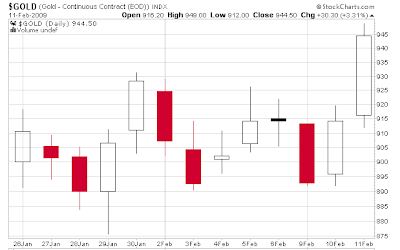 The above two charts show a very strong positive correlation between the US$ index and the price of gold. 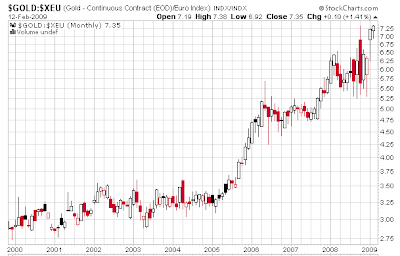 A near perfect inverse correlation to gold can be seen by looking at a chart of the Euro vs. the US$. 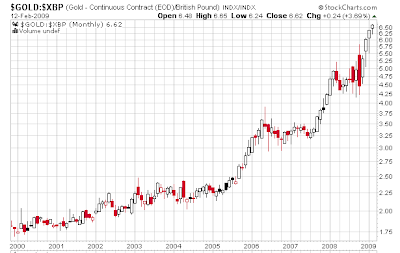 Many claim that gold is rising because of inflation. That argument, repeated daily, simply does not stand up under any scrutiny. 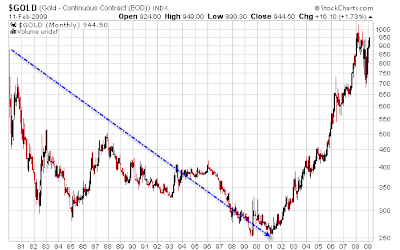 Gold fell from $850 to $250 over 20 years yet there was inflation, every step of the way. A more convincing theory, backed up in practice is that gold does well in times of severe credit dislocations. In 1971, Nixon Closed The Gold Window making the dollar inconvertible to gold and imposed wage and price controls. Commodity prices and interest rates soared for a decade. This was a credit event. The stock market panic in 1929, culminating in Roosevelt illegally confiscating gold during the Great Depression and devaluing the US dollar, was another credit event that strengthened the price of gold. A third credit event is happening right in front of our eyes. This credit event is the insolvency of the world's banking system, a deflationary event as detailed in Humpty Dumpty On Inflation. The important point now is that it is not just the US banks that are insolvent, but banks in the UK, and EU as well. A decade of heavy borrowing has lofted euro zone debt to $11 trillion, and it's starting to come due just when companies are strapped for cash . More toxic debt soon could come crashing through the global financial system. The surprising source: Europe Inc. Once-stodgy Old World companies, from cement makers to phone operators to chemical companies, went on an unprecedented borrowing spree over the past decade that has left them up to their necks in debt. Corporate debt in the euro zone stands at more than $11 trillion, equaling some 95% of the region's economy, vs. only 50% in the U.S. Hundreds of billions in payments are coming due just as sales are slumping in the global economic crisis. In better times, companies might have gone to the bank to refinance. No more. Bank lending to euro zone companies plunged 40% last fall as the credit squeeze tightened. 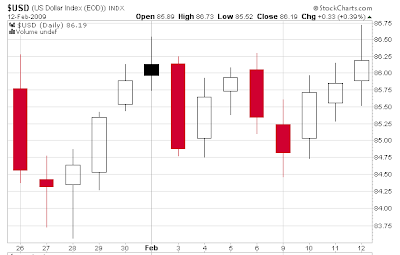 That helps explain why Europeans in January issued $159 billion in bonds, the highest level in two years. But the price is steep. Average yields on investment-grade European corporate bonds have almost tripled during the past year, even for relatively healthy companies such as Nokia (NOK) and German utility group E.ON (EONGN.DE). The higher cost of servicing debt "will entail a restriction in hiring, wage growth, and investment," says Gilles Moëc, a London economist with Bank of America (BAC). "The amount of debt to roll over is huge." Far too much attention has been pain on the plight of US banks and too little on the Eurozone banks, Chinese banks, and even Swiss banks that have lent trillions of Euros to Baltic states, and Latin America, loans that cannot be paid back. What cannot be paid back will default. A huge credit event is coming, and it's not just in the US. And that is the message of gold. 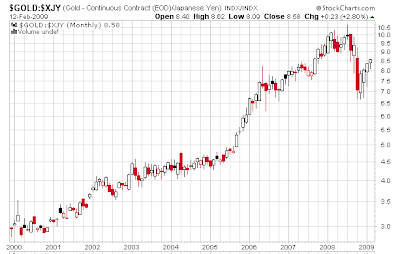 Gold is making new all time highs in nearly every currency except the Yen and the US dollar. 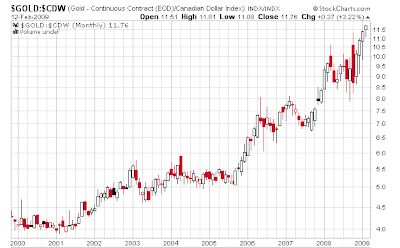 Moreover, and as shown above, gold has recently been moving in tandem with a falling Euro and rising dollar. This is not a sign of hyperinflation or indeed any kind of inflation. This is a sign of extreme credit stress, in nearly every country in the world.